Our truffle adventure was sadly over and it was time to head home the same way that we had come. The drive from Piedmont, Italy to Zurich took about six hours, and after stuffing our faces at the Christmas Market in Zurich that evening, we spent the night once again at the Marriott. We were up bright and early the next day, and the first leg of our journey home was an uneventful flight from Zurich to London where I dozed in and out of consciousness. Even though I was half-awake and wasn’t hungry, I’m not the type to miss a meal, and still grazed on the cold breakfast platter of cheese, bread, and cold cuts which was quite good. After a three hour layover at the British Airways Galleries Lounge, it was finally time for the final leg of our trip home. As an added bonus, it would be on the British Airways Airbus A380. The seat was essentially identical to the one on the Boeing 747, albeit a bit newer, but the layout on the A380 upper deck was much more spacious with a 2 x 3 x 2 layout. The Business Class cabin was split between the upper and lower decks, with about two-thirds of the Business Class seats up top. I had begrudgingly paid to reserve seats in advance so that my wife and I could secure a pair of seats along the window as opposed to being in the middle next to a stranger. As I had mentioned in my first review, I really did like the design of the seat and found it to be extremely spacious and comfortable. The spaciousness was in part due to the leg rest’s design which folded up and down, as opposed to extending from the seat itself. The downside was that you needed to climb over the leg rest of your neighbor to access the aisle from the window seat, but even with my above average level of clumsiness, this was a non-issue. And the biggest benefit of the window seat was the amount of privacy, and it felt like I had my own personal cave. Everything was running according to schedule, and I took one last peek out the window before we pulled back. About an hour after takeoff it was time to eat, and I fired up a movie to watch along with the perfect sunset view. I took a look through the menu, but since I had already pre-ordered my entree, the only decision left to make was on the starters. Dinner service started with nuts and drinks. Then, on to the smoked salmon and salad. The smoked salmon was surprisingly good, although the bread that came with this course was hard enough to double as a murder weapon. For my main entree I had pre-ordered the guinea fowl which was surprisingly good. 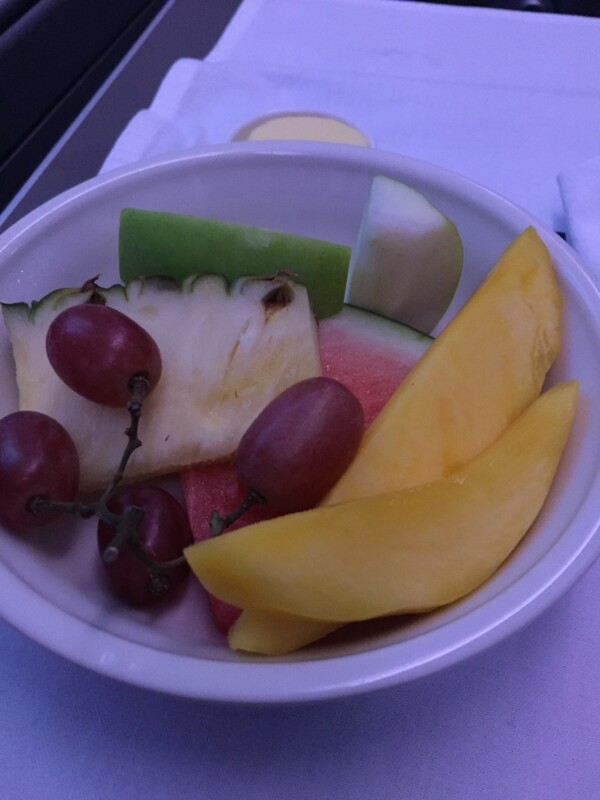 Overall, I had absolutely no complaints about the quality of the food on this flight. And then the spiced pear and custard tart to finish things up. I took one last peek out the window as the sun started to disappear, and then it was time to snooze. The flat-bed itself was really comfortable, and the incredible privacy of the seat meant that nobody was around to disturb me, and I slept like a baby for the next 8-9 hours. About two hours prior to departure, the light meal service began. I was still in a bit of a fog and thought about continuing to sleep, but I wasn’t about to pass up the final meal on this trip. First up was a refreshing tiger prawn salad. For my main course I had the chicken which was juicy and tender, although the cream sauce was way too heavy and I ended up dumping it out of the plate. And a fruit plate for dessert. We landed ahead of schedule, and I took one last look at our whale jet as we departed. Overall this was a solid flight on British Airways Business Class, even though the service on this flight was equally mediocre to my prior experience, but the fantastic seat alone which allowed me to sleep like a baby and arrive well-rested would be enough for me to consider flying it again in the future. So did you have pay those “extra” charges that BA imposes or is there a way around those? I paid for the seating charges but that was it, no additional extra charges or fees other than that. 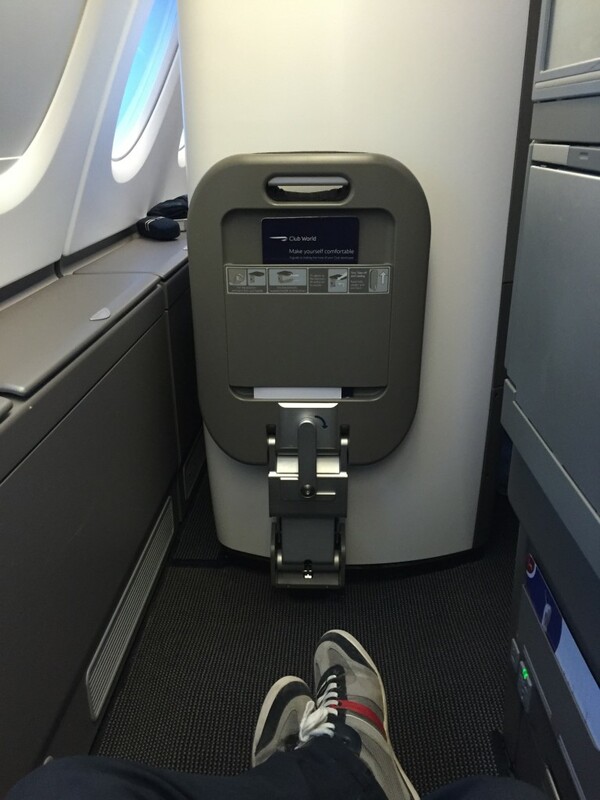 I thought BA always tacked on those “extra fees” when traveling using an award? Or was this not an award ticket? Gotcha – yes they do tack on fuel surcharges as part of awards and unfortunately there’s really no way around it. But in this case it was a paid ticket which was a pretty good deal with the Thanksgiving sale prices + the $400 AARP discount. Perhaps it’s the route but BA have failed to provision enough food for paying passengers on 5 of the last 6 long hauls I’ve taken on London – India routes. You were lucky to get fed let alone enjoy a pleasant dining experience. Whilst sadly all airlines are trying to reduce their cost base surely not carrying enough food for the number of tickets you’ve sold (as a full service flight) is a step too far on an 8hr+ flight?